A 1989 WCVM graduate, Dr. Tom Schmidt employs three graduates from his alma mater: "They don’t know it, but they are extraordinarily well prepared for a career in veterinary medicine." Submitted photo. Relationships and trust — these two words sum up the core values that have guided Dr. Tom Schmidt throughout his veterinary career. 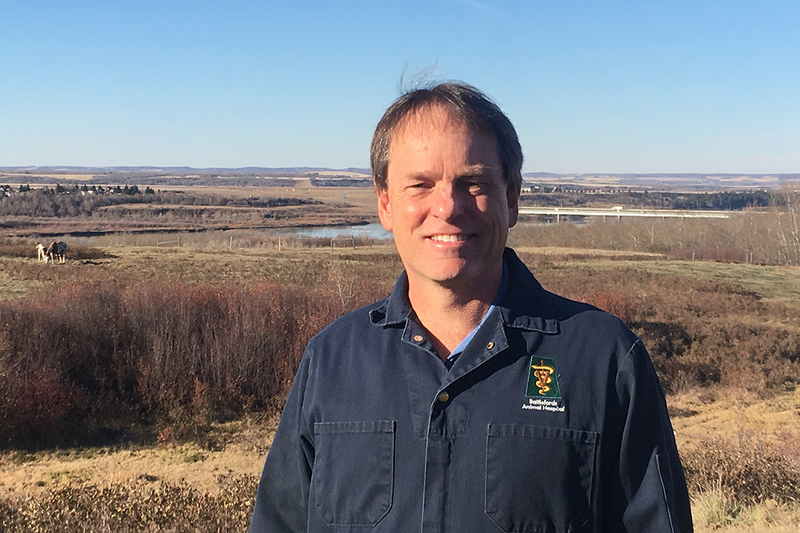 Since his graduation from the Western College of Veterinary Medicine (WCVM) in 1989, Schmidt has been a trusted clinician, adviser and friend to his clients in the North Battleford area. “A lot of my clients are third generation now, and when people turn to you because you have a relationship with them and they trust you, especially with the food animal practice, it’s like you’re promoting their economic well-being,” says Schmidt. Schmidt grew up in Saskatoon, Sask., and had never even “had a hand on a large animal” until his first year at the WCVM. But by graduation, he was more than prepared to start his career at a mixed animal practice in North Battleford. In 1999 Schmidt and his wife Sharon started their own practice, Battlefords Animal Hospital, where Schmidt’s job was to “medicate, communicate and surgicate” while Sharon looked after the business and operations side of the mixed animal clinic. Their practice has since expanded to include three more veterinarians — all of them WCVM graduates — who provide care for companion animals as well as beef cattle, horses and bison in the region. It’s no accident that Schmidt has hired WCVM graduates. An enthusiastic supporter of the veterinary college, he appreciates that the new graduates offer a chance for him and other staff members to gain exposure to the latest knowledge and material being taught at the WCVM. Through the years, the WCVM has been a significant resource for Schmidt who regularly refers clients to the WCVM Veterinary Medical Centre and uses Prairie Diagnostic Services for diagnostic testing. Schmidt also consults with WCVM faculty when he needs help with unusual cases or issues, and he appreciates that they’re always generous with their time and will go the extra mile to help out. Also a staunch supporter of the Saskatchewan Veterinary Medical Association (SVMA), Schmidt served several terms on the executive, including a term as president. He maintained his ties with the WCVM while representing the SVMA on the college’s advisory council and admissions committee for several years. Schmidt emphasizes the importance of SVMA initiatives such as the mentorship and preceptorship programs aimed at attracting veterinary students to rural practices. He also values the SVMA’s collaborations with practicing veterinarians and government agencies to tackle difficult issues such as bovine spongiform encephalopathy (BSE) cases and mycotoxin poisoning. Schmidt points out that these collaborations owe much of their success to the WCVM. The college’s Disease Investigation Unit, headed by Dr. John Campbell, was developed through a partnership with Saskatchewan’s Ministry of Agriculture to address these kinds of complex and unusual animal health situations. When Schmidt reflects on his career, he’s most satisfied by the connections he’s made with his clients and the support he can provide for them — particularly the large animal clients. Schmidt also appreciates the relationships he’s established with his companion animal clients and their pets. He points to advancements in small animal medicine that have increased the quality of medical care that’s available to them. Schmidt’s dedication to his profession hasn’t gone unnoticed. In 2012 he received the J.J. Murison Distinguished Veterinarian Award, the highest level of SVMA recognition that’s presented annually to a deserving member in acknowledgement of their service to the organization, the profession and the public. In addition to operating their busy practice, the Schmidts found time for their family and community. They raised four daughters who have now left home to pursue their successful careers. Sharon spent several years managing the Battleford Children’s Choir and attending music festivals across Canada. Their clinic has also welcomed and encouraged many local students who might be considering a veterinary career and want to get some experience or just spend some time observing in the clinic. Schmidt enjoys living in a small community where people know each other and look out for each other, and he’s grateful that he and Sharon have been able to make a difference in their area.